The Scotch whisky industry in Scotland is worth north of £5bn, the vast majority of which is produced in the Highlands and Islands of these fertile lands. Whisky is big business – a fact reflected by the scale of foreign and corporate ownership in the industry – but beneath all of that, an artisan movement is gaining ground, and Glasgow is playing its part. Once hugely important to the whisky industry thanks to ships leaving the Clyde with hulls full of Scotch for carousers across the globe, Glasgow is slowly re-emerging, thanks mainly to two openings by entrepreneurs seizing an opportunity to create small-batch spirits for the premium market. While the Glasgow Distillery and Visitors’ Centre gained much media exposure for establishing a new distillery in a former pump house on the banks of the Clyde, it was the similarly named Glasgow Distillery Company that was first to market. The two distilleries will provide competition for Auchentoshan, one of the few surviving lowland distilleries and often considered Glasgow’s distillery. Owned by Japanese firm Suntory, Auchentoshan has been revitalised with contemporary branding and a number of special editions to complement its much-awarded standard range. While many larger whisky players from Dewar’s to Whyte & Mackay are based in Glasgow, the city’s only other link to actual malt production is Glengoyne, the most southerly of the Highland distilleries, just a short drive north of the city. And while its new whisky matures for a legal minimum of three years, the Glasgow Distillery Company has launched Makar Gin. The timing couldn’t have been better, with a gin revival meaning Glasgow’s now sprinkled with gin bars, including Gin71 and Alston Bar & Beef. 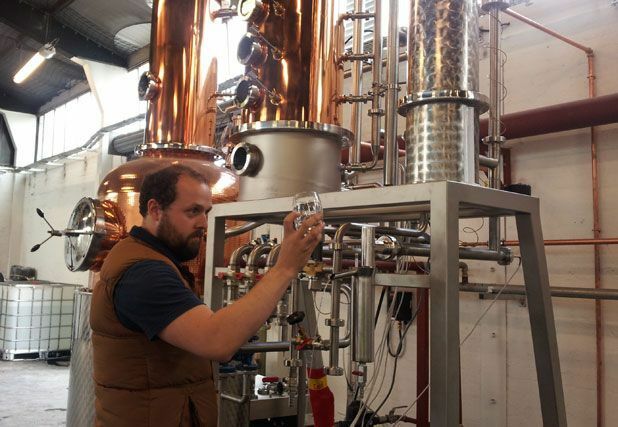 ‘Gin is currently undergoing a significant renaissance, with consumers seeking out new and interesting brands that deliver a high-quality experience,’ says Glasgow Distillery Company’s gin creator Mike Hayward. With its heavy use of juniper, Makar makes for an excellent gin and tonic. ‘We wanted to re-focus on the traditional botanical – juniper – and bring it to the forefront as the core botanical at the heart of the gin,’ he continues. To support the juniper a supporting cast of angelica root, coriander seeds, cassia bark, liquorice, black pepper, fresh lemon peel and rosemary are added. Specialist off-licence the Good Spirits Company has reported strong sales of Makar Gin, so it would seem there is an appetite for Glasgow-made spirits – and as for whisky, when we’ve waited a century, another three years doesn’t seem like much at all.